Fibromyalgia is a chronic pain syndrome with unknown etiology. Recent studies have shown some evidence demonstrating that oxidative stress may have a role in the pathophysiology of fibromyalgia. However, it is still not clear whether oxidative stress is the cause or the effect of the abnormalities documented in fibromyalgia. Furthermore, the role of mitochondria in the redox imbalance reported in fibromyalgia also is controversial. We undertook this study to investigate the role of mitochondrial dysfunction, oxidative stress, and mitophagy in fibromyalgia. We studied 20 patients (2 male, 18 female patients) from the database of the Sevillian Fibromyalgia Association and 10 healthy controls. We evaluated mitochondrial function in blood mononuclear cells from fibromyalgia patients measuring, coenzyme Q10 levels with high-performance liquid chromatography (HPLC), and mitochondrial membrane potential with flow cytometry. Oxidative stress was determined by measuring mitochondrial superoxide production with MitoSOX™ and lipid peroxidation in blood mononuclear cells and plasma from fibromyalgia patients. Autophagy activation was evaluated by quantifying the fluorescence intensity of LysoTracker™ Red staining of blood mononuclear cells. Mitophagy was confirmed by measuring citrate synthase activity and electron microscopy examination of blood mononuclear cells. We found reduced levels of coenzyme Q10, decreased mitochondrial membrane potential, increased levels of mitochondrial superoxide in blood mononuclear cells, and increased levels of lipid peroxidation in both blood mononuclear cells and plasma from fibromyalgia patients. Mitochondrial dysfunction was also associated with increased expression of autophagic genes and the elimination of dysfunctional mitochondria with mitophagy. These findings may support the role of oxidative stress and mitophagy in the pathophysiology of fibromyalgia. Fibromyalgia (FM) is a common chronic pain syndrome accompanied by other symptoms such as fatigue, headache, sleep disturbances, and depression. It is diagnosed according to the classification criteria established by the American College of Rheumatology (ACR) . Despite being a common disorder that affects at least 5 million individuals in the United States , its pathogenic mechanism remains elusive. Recently oxidative stress markers were proposed as a relevant event in the pathogenesis of this disorder [3, 4]. Previously, we detected decreased coenzyme Q10 (CoQ10) levels and increased reactive oxygen species (ROS) production in blood mononuclear cells of FM patients, providing direct evidence of increased oxidative stress at the cellular level . CoQ10 plays a crucial role in cellular metabolism, acting as an electron carrier between complexes I and II and complex III of the mitochondrial respiratory chain. CoQ10 also has been reported to play an important role in the regulation of uncoupling proteins, mitochondrial permeability transition pore, β-oxidation of fatty acids, and the nucleotide-biosynthesis pathway . Moreover, CoQ10 levels have been suggested to be useful as a mitochondrial-dysfunction marker . CoQ10 deficiency induces decreased activities of complex II + III, complex III and complex IV, reduced expression of mitochondrial proteins involved in oxidative phosphorylation, decreased mitochondrial membrane potential, increased production of reactive oxygen species (ROS), activation of mitochondrial permeability transition (MPT), mitophagy of dysfunctional mitochondria, and reduced growth rates [8, 9]. The purpose of the present work was to assess the mitochondrial dysfunction in blood mononuclear cells of FM patients and to elucidate whether mitochondrial disturbance was involved in the pathophysiology of oxidative stress present in FM. The study was performed with the informed consent of all participants and the approval of the local ethical committee. We studied 20 patients (two male and 18 female patients) recruited from the database of the Sevillian Fibromyalgia Association (AFIBROSE) and 10 healthy controls (two male and eight female patients). The diagnosis of FM was established by an experienced rheumatologist according to ACR criteria . All patients and controls had not taken any drug or vitamin/nutritional supplement during a 15-day period before the collection of the blood samples. Peripheral blood mononuclear cells (BMCs) were purified from heparinized blood with isopycnic centrifugation by using Histopaque-1119 and Histopaque-1077 (Sigma Chemical Co., St. Louis, MO, USA). BMCs were cultured at 37°C in a 5% CO2 atmosphere in RPMI-1640 medium supplemented with L-glutamine, an antibiotic/antimycotic solution (Sigma Chemical Co.), and 10% fetal bovine serum. BMCs were cultured in six-well plates (35-mm diameter well) until confluence. Mitotracker Red CMXRos (Invitrogen/Molecular Probes, Eugene, OR, USA) 100 nmol/L was added and incubated for 30 min. Then cells were washed and analyzed with flow cytometry. Mitochondrial ROS generation in BMCs was assessed with MitoSOX™ (Invitrogen/Molecular Probes, Eugene, OR, USA) incubated with 1 μmol/L MitoSox for 30 min at 37°C and washed twice with PBS. Cells were analyzed with flow cytometry. To assay ROS production with antioxidants, mononuclear cells were incubated 24 h with 10 μmol/L CoQ10, 30 μmol/L α-tocopherol (α-toc), and 10 mmol/L N-acetylcisteine (N-Acet; Sigma Chemical Co.). TBARS (thiobarbituric acid reactive substances) levels in plasma were determined by a method based on the reaction with thiobarbituric acid at 90-100°C. Lipid peroxidation in cells was determined by analyzing the accumulation of lipoperoxides with a commercial kit from Cayman Chemical (Ann Arbor, Michigan, USA). TBARS are expressed in terms of malondialdehyde (MDA) levels. In these assays, an MDA standard is used to construct a standard curve against which unknown samples can be plotted. BMCs were cultured in RPMI-1640 medium. LysoTracker™ red (Invitrogen/Molecular Probes) (100 nmol/L), a cell-permeant fluorophore that typically concentrate in acidic vacuoles, was added to isolated BMCs from control and FM patients. After 30 min, cells were washed, and the red fluorescence of LysoTracker was quantified with flow cytometry. The expression of both MAP-LC3 and BECLIN 1 genes in BMCs was analyzed with SYBR Green quantitative PCR by using mRNA extracts and primers. Real-time BECLIN 1 primers 5'-GGA TGG ATG TGG AGA AAG GCA AG-3' (forward primer) and 5'-TGA GGA CAC CCA AGC AAG ACC-3' (reverse primer) amplify a sequence of 152 nucleotides. Human MAP-LC3 primers 5'-GCC TTC TTC CTG CTG GTG AAC-3' (forward primer) and 5'-AGC CGT CCT CGT CTT TCT CC-3' (reverse primer) amplify a sequence of 91 nucleotides. Actin was used as a housekeeping control gene. The specific activity of citrate synthase in whole-cell extracts prepared from BMCs was measured at 412 nm minus 360 nm (13.6 mmol/L/cm) by using 5,5-dithio-bis(2-nitrobenzoic acid) to detect free sulfhydryl groups in coenzyme A, as described previously . BMCs were fixed for 15 min with 2% glutaraldehyde in culture medium and then for 30 min in 2% glutaraldehyde-0.1 mol/L NaCacodylate/HCl, pH 7.4. Samples were processed as described previously . Observations were performed on a Philips CM-10 transmission electron microscope. All results are expressed as mean ± SD, unless stated otherwise. The unpaired Student's t test was used to evaluate the significance of differences between groups. Statistical analyses included Pearson's correlations between CoQ10 levels and autophagic gene expression levels. The P values less than 0.05 were considered significant. The mean age of patients was 50.8 ± 8.6 years for the FM group and 49.1 ± 9.8 years for the control group. The mean duration of symptoms in the FM group was 13.65 ± 9.19 years. The mean tender points in the FM group were 14.9 ± 3.1 points. The most prominent features of these FM patients were pain and stiffness. They were sedentary people. Routine laboratory tests yielded normal results for glucose, urea, uric acid, total protein, creatinine, aspartate aminotransferase, alanine aminotransferase, cholesterol, and triglycerides (data not shown). CoQ10 levels, determined in BMCs isolated from 20 FM patients, were found to be about 40% lower than those in control cells (Figure 1a). To examine further the mitochondrial dysfunction in BMCs from FM patients, we determined the mitochondrial membrane potential (ΔΨm) with flow cytometry. Mitochondrial membrane potential was significantly reduced by about 36% in BMCs from FM patients (Figure 1b). 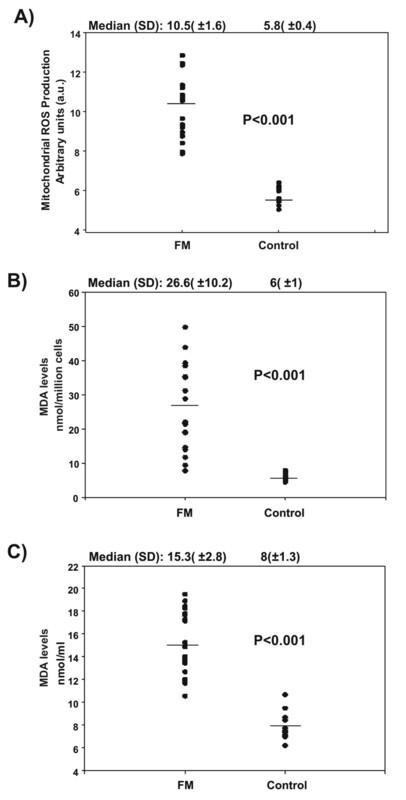 Coenzyme Q 10 levels and mitochondrial membrane potential (ΔΨm) in blood mononuclear cells (BMCs) from fibromyalgia (FM) patients and healthy control subjects. (a) CoQ10 levels were measured with high-performance liquid chromatography, as described in Materials and Methods. Data represent the mean ± SD of three separate experiments. (b) Mitochondrial membrane potential was analyzed in BMCs from control subjects and FM patients with flow cytometry, as described in Materials and Methods. Data represent the mean ± SD of three separate experiments. *P < 0.001 between controls and FM patients. Oxidative stress has been proposed as a relevant event in the pathogenesis of FM [3, 12]. In a previous work, we showed the presence of high levels of ROS production in the BMCs of FM patients . To assess the mitochondrial origin of ROS production, BMCs from FM patients and controls were exposed to MitoSOX™, a red mitochondrial superoxide indicator. 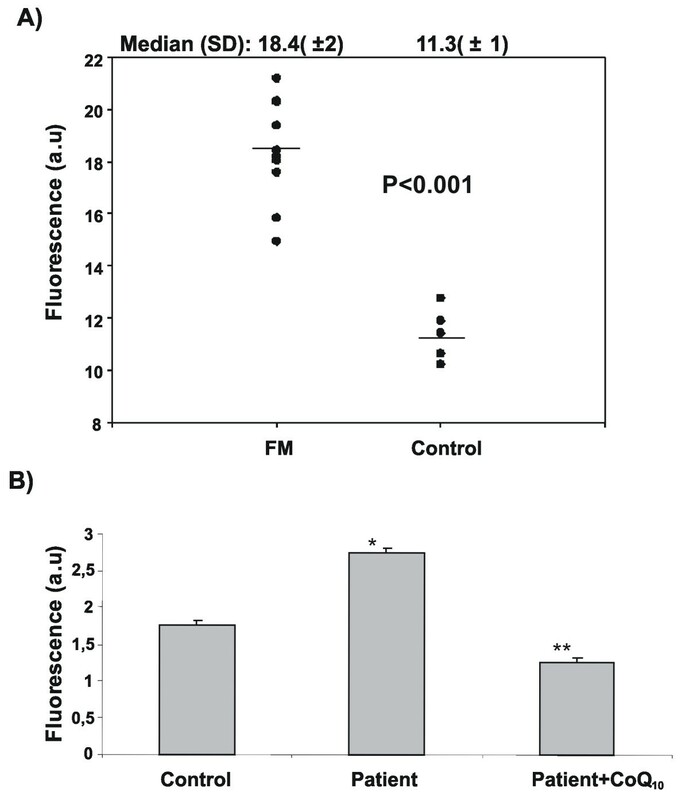 Quantification of ROS production with flow-cytometry analysis demonstrated a significant increase in ROS production in mitochondria of BMCs from FM patients with respect to control (Figure 2a). Additionally, we determined lipid peroxidation as a marker of oxidative stress-induced membrane damage by mitochondrial ROS in BMCs and plasma from FM patients. On average, FM patients showed a higher level of lipid peroxidation in both cells and plasma with respect to control subjects (Figure 2b and 2c). Reactive oxygen species (ROS) production and lipid peroxidation in fibromyalgia (FM) patients. (a) ROS production was analyzed in BMCs from control subjects and FM patients with flow cytometry, as described in Materials and Methods. Lipid peroxidation (MDA levels) in blood mononuclear cells (BMCs) (b) and plasma (c) from control subjects and FM patients were determined as described in Materials and Methods. Data represent the mean ± SD of three separate experiments. *P < 0.001 between controls and FM patients. Further to examine the role of ROS generation in FM, BMCs of one representative patient were incubated with three antioxidants, CoQ10, α-toc, and N-Acet, and mitochondrial ROS production was examined (Figure 3). Only lipophilic antioxidants, CoQ10 and α-toc, significantly attenuated ROS production. Effect of antioxidants on reactive oxygen species (ROS) generation. Blood mononuclear cells (BMCs) of representative fibromyalgia (FM) patients were treated with 10 μmol/L CoQ10, 30 μmol/L α-tocopherol (α-toc), and 10 μmol/L N-acetylcysteine (N-Acet) for 24 h. Data represent the mean ± SD of three separate experiments. 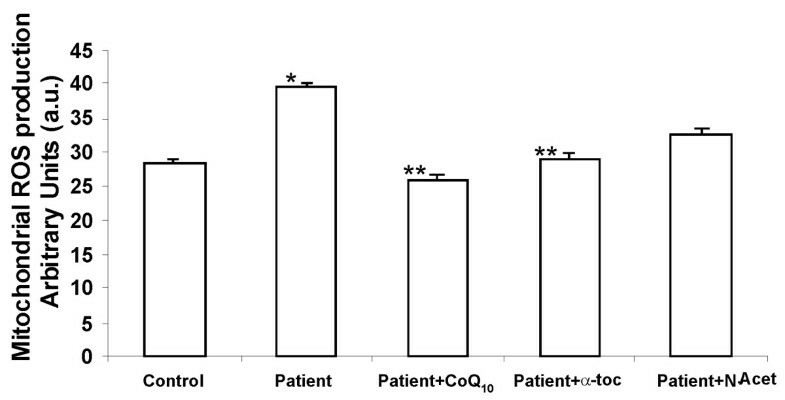 *P < 0.001 between controls and FM patients; **P < 0.005 between the absence or presence of CoQ10 and α-toc treatment. Recently, it was demonstrated that CoQ10-deficient fibroblasts exhibit increased levels of lysosomal markers (β-galactosidase, cathepsin, LC3, and Lyso Tracker) and enhanced expression of autophagic genes at both transcriptional and translational levels, indicating the presence of autophagy . To verify that CoQ10 deficiency also induces activation of autophagy in BMCs from FM patients, we first quantified levels of acidic vacuoles in BMCs by using Lysotracker fluorescence and flow-cytometry analysis. Acidic vacuoles were significantly increased in patient BMCs with respect to controls (Figure 4a). To elucidate whether autophagy in CoQ10-deficient BMCs could be mitigated by restoring mitochondrial functionality by CoQ10 supplementation, we cultured both control and patient BMCs in the presence of CoQ10 (100 μmol/L) for 24 hours and analyzed them by Lysotracker fluorescence. As is shown in Figure 4b, CoQ10 supplementation drastically reduced the intensity of Lysotracker fluorescence, indicating a reduction in lysosomal activity after CoQ10 treatment. Autophagic markers in blood mononuclear cells (BMCs) from fibromyalgia (FM) patients. (a) Quantification of acidic vacuoles in control and patient BMCs by LysoTracker fluorescence and flow-cytometry analysis. (b) Reduction of LysoTracker fluorescence in BMCs from FM patients under CoQ10 supplementation (100 μmol/L) for 24 h. Data represent the mean ± SD of three separate experiments. *P < 0.001 between controls and FM patients. In addition, we analyzed the expression of genes involved in autophagic processes, such as BECLIN 1 and MAP-LC3. Figure 5a and 5b show that autophagic genes were overexpressed in BMCs of five of the eight patients tested as compared with controls. FM patients with increased expression of autophagic genes were those with a most pronounced CoQ10 deficiency (P3, P5, P6, P7, P8). A negative correlation was seen between the expression of autophagic genes and CoQ10 levels (r = -0.80, P < 0.01 for BECLIN 1, and r = -0.76, P < 0.001 for MAP-LC3) (Figure 5c). Autophagic genes expression. 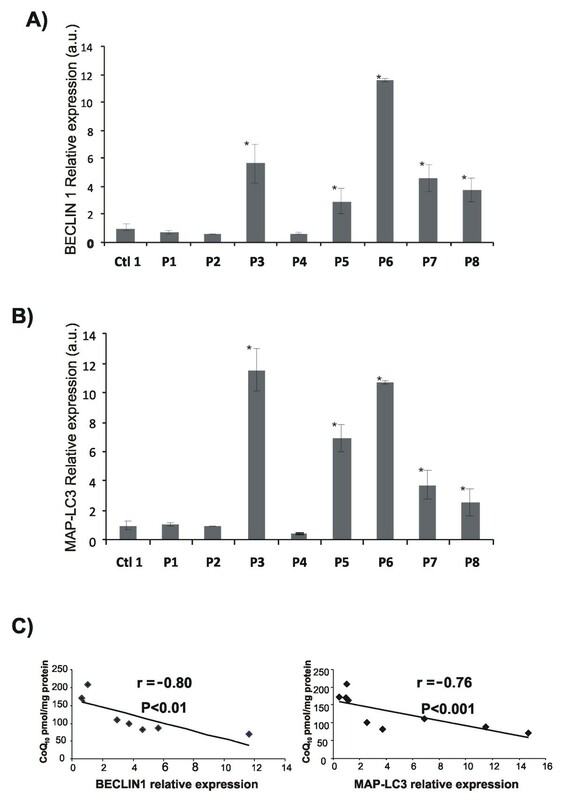 Expression levels of BECLIN 1 (a) and MAP-LC3 (b) transcripts in blood mononuclear cells (BMCs) from control and fibromyalgia (FM) patients were assessed with real-time polymerase chain reaction (PCR), as described in Materials and Methods. Data represent the mean ± SD of three separate experiments. *P < 0.001 between controls and FM patients. (c) Correlation of CoQ10 levels and BECLIN 1 and MAP-LC3 expression levels in BMCs from FM patients. To determine whether autophagy was specific for mitochondria, we first examined mitochondrial mass in BMCs derived from FM patients. BMC extracts were prepared from control and FM patients and analyzed for citrate synthase activity. Citrate synthase is a mitochondrial matrix protein whose activity has been shown to correlate well with mitochondrial mass . Figure 6a shows a statistically significant decrease in citrate synthase activity in BMCs from FM patients compared with controls. The reproducible reduction in citrate synthase activity indicates a decrease in mitochondrial mass and suggests selective degradation of mitochondria. To confirm the presence of mitochondrial degradation or mitophagy in BMCs, we then performed electron microscopy on control and patient BMCs (Figure 6b and 6c. Figure 6c clearly shows the presence of autophagosomes in BMCs from a representative FM patient (P6), indicating extensive autophagy of mitochondria. In early autophagosomes, it can clearly be observed that mitochondria are being degraded. Mitophagy in fibromylagia (FM) patients. (a) Decreased mitochondrial mass in blood mononuclear cells (BMCs) from FM patients. Citrate synthase specific activity in BMCs from control and FM patients was performed, as described in Materials and Methods. Data represent the mean ± SD of three separate experiments. *P < 0.001 between control and FM patients. (b) Ultrastructure of BMCs from FM patients. The control BMCs show mitochondria with a typical ultrastructure. 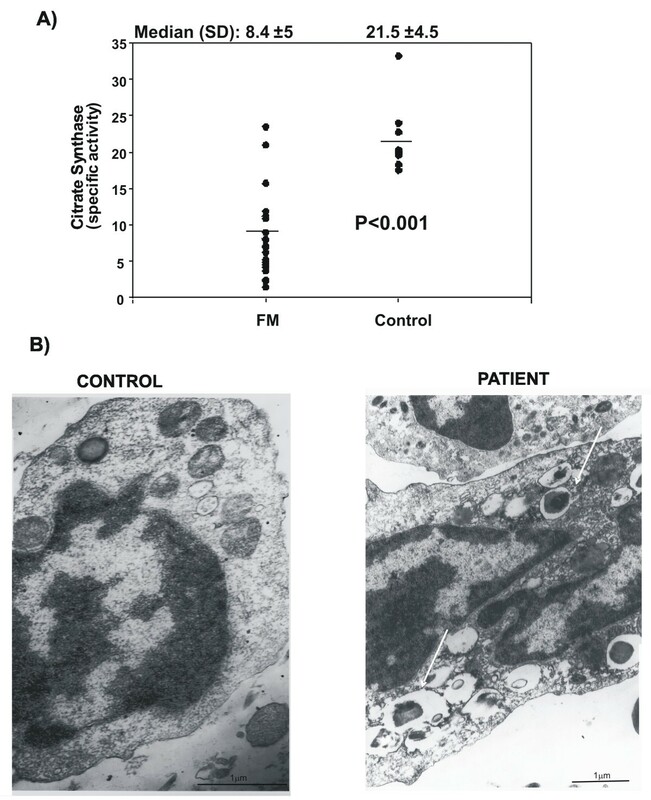 Autophagosomes with mitochondria (arrows) were present in BMCs from a representative FM patient (P6); Bar = 1 μm. Mitochondria generate energy primarily in the form of the electrochemical proton gradient, which fuels ATP production, ion transport, and metabolism. Mitochondria are also the major source of ROS. Both complexes I and III, along with CoQ10, leak electrons to oxygen [14–17]. CoQ10deficiency has been associated with a variety of human disorders, some of them caused by a direct defect of CoQ10 biosynthesis genes or as a secondary consequence of other diseases [18, 19]. Recent findings show that CoQ10 deficiency alters mitochondrial function and mitochondrial respiratory complex organization, leading to increased ROS generation, activation of MPT, and increased autophagy of dysfunctional mitochondria by mitophagy [8, 9]. In the present study, we found that CoQ10-deficient BMCs in FM patients showed high levels of ROS production in mitochondria and increased levels of lipid peroxidation in both cells and plasma. In this respect, high levels of lipid peroxidation and protein carbonyls [20, 21] and disturbances in the homeostasis of platelet ATP have been observed in FM patients . The fact that CoQ10 and α-toc, two lipophilic antioxidants, significantly reduced mitochondrial ROS production, also suggests that ROS are produced in the lipophilic environment of mitochondrial membranes and that CoQ10 deficiency may be involved in oxidative stress in FM. If oxidative damage plays a role in FM through the activation of MPT and mitophagy, then therapeutic strategies that reduce ROS may ameliorate the pathologic process. What is the relation between oxidative stress and FM symptoms? Recent studies showed that oxidative stress can cause peripheral and central sensitization and alter nociception , resulting in hyperalgesia mediated by both local and spinal oxidant mechanisms. Furthermore, oxidative stress is increased in patients with chronic-fatigue syndrome [24, 25]. Superoxide plays a major role in the development of pain through direct peripheral sensitization, the release of various cytokines (for example, TNF-α, IL-1β, and IL-6), the formation of peroxynitrite (ONOO-), and PARP activation . In addition, studies on depression, a typical symptom in FM patients, have elucidated the possible link between depression and lipid peroxidation . Lipid peroxidation may play an important role in depression, and the peroxidation-reducing effect of different selective serotonin reuptake inhibitors in major depression was demonstrated by Bilici and associates . In addition, and supporting the role of mitochondrial dysfunction, BMCs of FM patients showed a decrease of 36% of mitochondrial membrane potential (ΔΨm), possibly reflecting a reduced electron flow and proton pumping caused by CoQ deficiency. 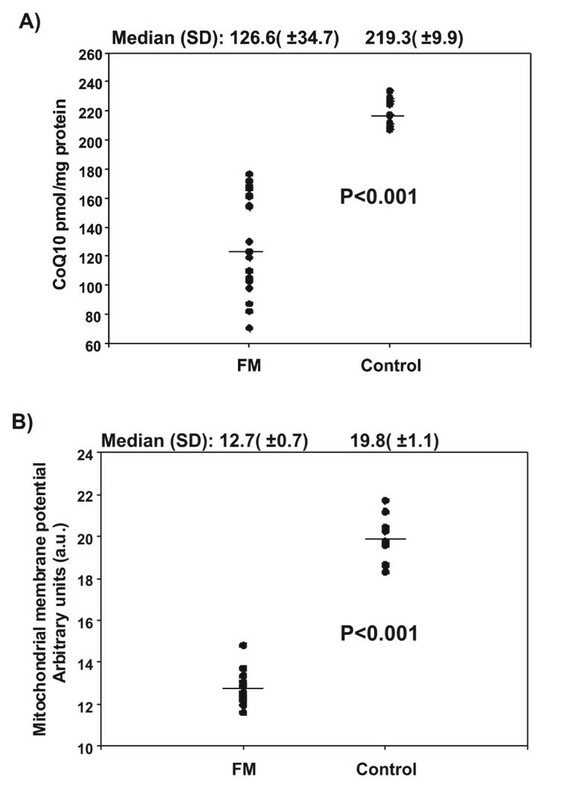 Interestingly, a positive correlation between the content of CoQ10 in BMCs and skeletal muscle [28, 29] was demonstrated; therefore, CoQ10 deficiency and mitochondrial dysfunction can also be present in other cells and tissues in FM patients. Furthermore, changes in the morphology and number of mitochondria have been shown in skeletal muscle from FM patients [30–32], suggesting the role of mitochondrial dysfunction in this disorder. CoQ deficiency, mitochondrial dysfunction, and cell bioenergetics alteration could also explain the low muscular and aerobic capacity observed in some groups of FM patients [33, 34]. It has been proposed that ROS damage can induce MPT by opening of permeability transition pores in the mitochondrial inner membrane [35–37]. This, in turn, leads to a simultaneous collapse of mitochondrial membrane potential and the elimination of dysfunctional mitochondria by mitophagy. Our results support this hypothesis, showing the presence of mitophagy in BMCs of FM patients. Autophagy is a regulated lysosomal pathway involved in the degradation and recycling of cytoplasmic materials [38–42]. During autophagy, cytoplasmic materials are sequestered into double-membraned vesicles, 'autophagosomes', which then fuse with lysosomes to form autolysosomes, in which degradation of cellular structures occurs. Many cellular stresses can cause induction of autophagy, such as endoplasmic reticulum stress, mitochondrial dysfunction, or oxidative stress [42–44]. 'Mitophagy' was coined to describe the selective removal of mitochondria by autophagy during development and under pathologic conditions [36, 45]. In our work, biochemical analysis of citrate synthase indicated a depletion of mitochondrial mass, suggesting selective mitochondrial degradation by mitophagy in BMCs from FM patients. These results were confirmed with electron microscopy that clearly shows autophagosomes where mitochondria are being degraded. Autophagy can be beneficial for the cells by eliminating dysfunctional mitochondria, but massive autophagy can promote cell injury  and may contribute to the pathophysiology of FM. Our study supports the hypothesis that CoQ10 deficiency, oxidative stress, and extensive mitophagy can contribute to cell-bioenergetics imbalance, compromising cell functionality. Abnormal BMC performance can promote oxidative stress and may contribute to altered nociception in FM. Mario D Cordero, Manuel De Miguel contributed equally to this work. This work was supported by grants FIS PI080500 and FIS EC08/00076, Ministerio de Sanidad, Spain. The authors dedicate this manuscript to FM patients and AFIBROSE (Asociación de Fibromialgia de Sevilla) for their unconditional help. MDC, MDM, AMNF, IMCL, and JGM carried out the biochemical studies. DC and LGI carried out the electron microscopy studies. PB and FC participated in the design of the study and performed the statistical analysis. PB, PN, and JASA conceived of the study, participated in its design and coordination, and helped to draft the manuscript. All authors read and approved the final manuscript. This article is published under license to BioMed Central Ltd. This is an open access article distributed under the terms of the Creative Commons Attribution License (http://creativcommons.org/licenses/by/2.0), which permits unrestricted use, distribution, and reproduction in any medium, provided the original work is properly cited.